Wharton-Smith Celebrates Grand Opening of Osceola County's Fire Station 62 & 65th Infantry Veterans Park | Wharton Smith, Inc.
Sanford, FL – April 11, 2018 marked the official dedication and grand opening of Osceola County’s newest public safety facility, Fire Rescue Station 62 located within the Buenaventura Lakes community. 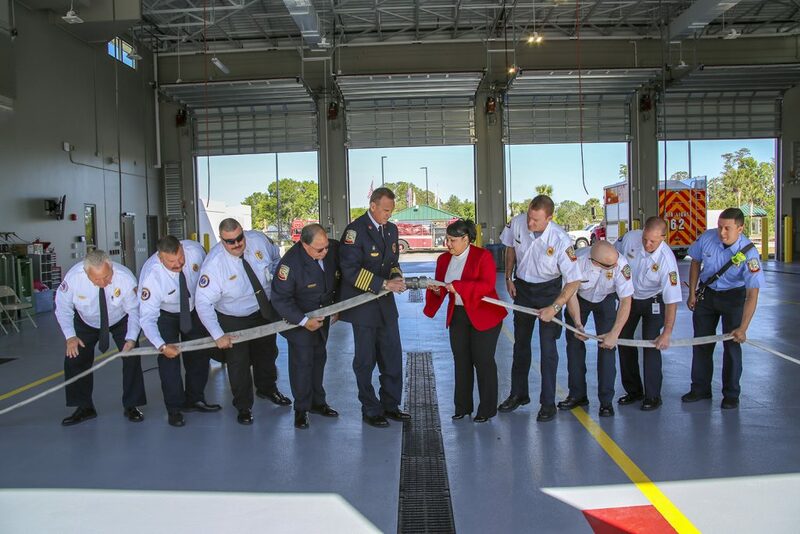 Osceola County District 2 Commissioner Viviana Janer and Fire Chief Robert Sorensen welcomed the crowd gathered within the station’s four-truck bay and led the ceremonial ‘uncoupling’ using the station’s new fire hose to welcome Station 62. The event also marked a special dedication and unveiling of a bronze plaque representing an oversized replica of the Congressional Gold Medal awarded by President Obama to the men of the 65th Infantry Regiment. The fire station sits adjacent to the 65th Infantry Veterans Park which was upgraded as part of the project. Known as the Borinqueneers, the Regiment is made up of Puerto Rican soldiers who fought for the United States in World War I, II and the Korean War. The plaque will remain on display outside Station 62. Constructed from the same C.T. Hsu + Associates prototype as Station 64, Station 62 is a 24-hour operational facility built to stringent 150 mph wind and debris impact ratings. The facility consists of accommodations to house three, 12-man shifts including a state-of-the-art kitchen, break area, living quarters, training space, support areas for the Chief, Lieutenant and crew, and a community room that can be used for small group meetings. Upgrades to the park included expanding the parking lot, adding a new restroom facility, two new park pavilions along the water, a performance stage pad complete with power and data, new LED site lighting, new sidewalks, and new site drainage to alleviate issues with local flooding. The park also features a dedication plaque to the 65th Infantry. “We are fortunate to continue to have a strong partnership with Osceola County,” said Darin Crafton, Executive Vice President – Commercial. “Projects such as this that improve the safety of our communities is at the core of why Wharton-Smith is in business,” he added.